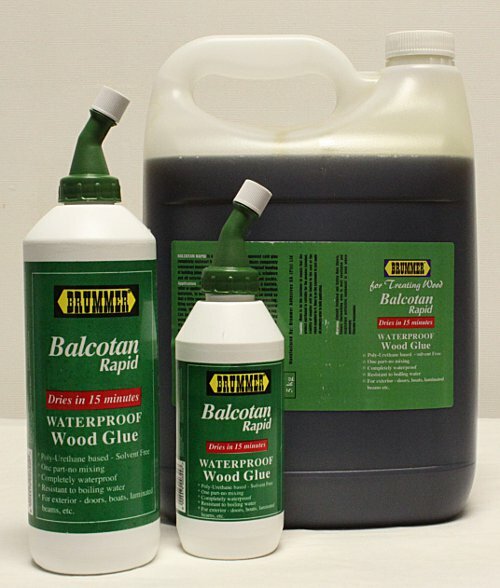 BALCOTAN RAPID is a one part polyurethane based waterproof wood glue. Unlike the PVA Cold Glue which is only water resistant, BALCOTAN RAPID is completely waterproof. It also has tremendous gap filling properties. BALCOTAN RAPID is not affected by UV or any other outside elements. BALCOTAN RAPID dries to a working bond in 15 minutes. Due to the sensitivity of the product to moisture, decanting is not recommended as the turbulence could cause premature curing. Apply to both sides and clamp for 15 minutes.